One of the best ways to experience fencing for the first time is through our group classes. These classes are designed to be fun, educational, and provide a relaxed environment where you can be active and get involved in a great sport alongside other interested newcomers. For more information about upcoming classes at Hooked on Fencing, see the sections below. If you would like to learn this amazing sport at a time that fits your busy schedule, we do offer for a similar price a series of personalized, one-on-one lessons with one of our coaches any time during our weekly hours. Once you've got a handle on the basics, you can then fence with other members near your skill level. You can learn more here. Younger then 9 years? Check out our buccaneers for kids ages 6 to 8. If you have a Groupon voucher for our 90 minutes introductory group class, you can schedule it through this page. Our 6 week introductory fencing class is for ages 9-12, on Saturday mornings. The introductory class is for enthusiastic kids looking to have fun and try out a new sport, and is designed for first-time fencers. The class size is limited to 12 students. The total cost of the class is $150. Boys and girls are welcome, and all equipment is provided at no extra charge! The Youth Class is a great way to get active and be involved in a cool sport. Students will learn about fencing, receive lessons, and participate in footwork drills. Students will learn the basic skills necessary for fencing and will build their skill level as the class progresses. The class stresses the importance of footwork in fencing and students will learn to combine footwork with blade skills. Most importantly, this class is an opportunity to have fun, make friends, and discover a very cool new sport. Our goal is to create an enjoyable experience with the hope that students will pursue their interest in fencing beyond the class. Like many others, we hope that you too will become Hooked on Fencing! The Winter Adult Class is a 6 week program starting on Saturday, January 19th, from 1pm to 2:30pm. All equipment is provided! 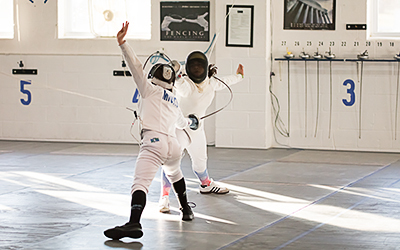 The class is for first-time fencers who are looking to have a great time trying something new. Each class is limited to 12 fencers, and the total cost of the class is $150. The program is designed to increase in intensity throughout the 6-week course. 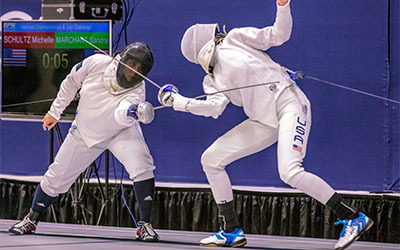 Absolutely no knowledge of fencing is required, and you'll be learning alongside other newcomers to the sport in a comfortable and fun environment. This co-ed program is all about having a great time, staying active, and discovering a unique and exciting new sport. In this class, you will learn basic fencing skills, and get the chance to try them out against other members of the class! At Hooked on Fencing, all of our instructors are committed to providing safe, fun, and skill-focused activities for new fencers. Again, all equipment is provided!!! Our goal is to provide a great experience with the hope that students will pursue their interest in fencing beyond the class. Like many others, we hope that you too will become Hooked on Fencing!